There’s a little bit of a wanderer in all of us. But only a few have the courage to pack up their bags and brave the outside world and explore what it has in store for them. The Lifestyle Portal is proud to share the story of this dusky beauty Rucha Karve, a 28-year-old home baker and a blogger from Mumbai. A wife of a merchant naval officer and a mother of a four-and a half-year-old who didn’t allow the four walls of domesticity curb her enthusiasm. Instead, this gorgeous woman packed her bags and started exploring the world with her little one as her travel partner. “I have always loved adventure travel. 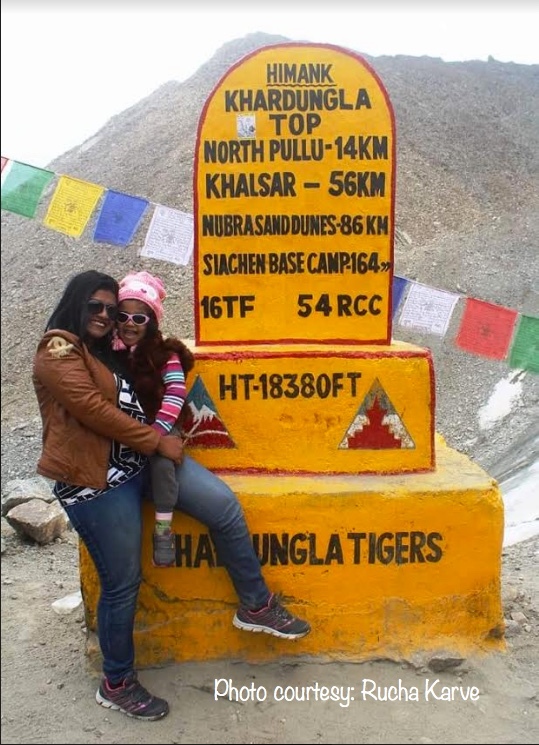 I had been trekking throughout my college days and then life happened and this part of me got totally left behind,” recalls Rucha. 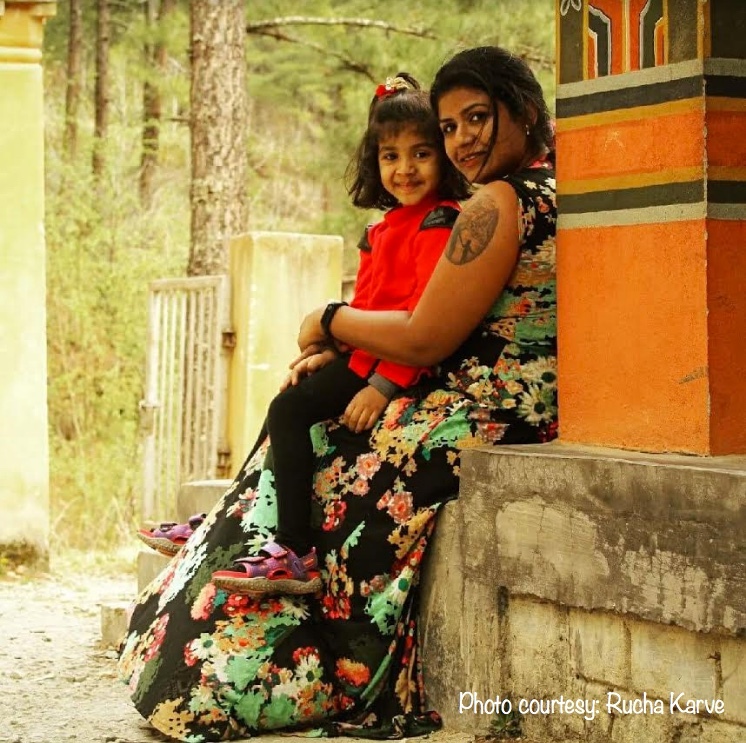 Fast forward to being a mum, with a husband who is in the merchant navy and is around only a couple months a year, Rucha shares that when her daughter Advika was born they couldn’t plan a vacation since his return dates are never certain. 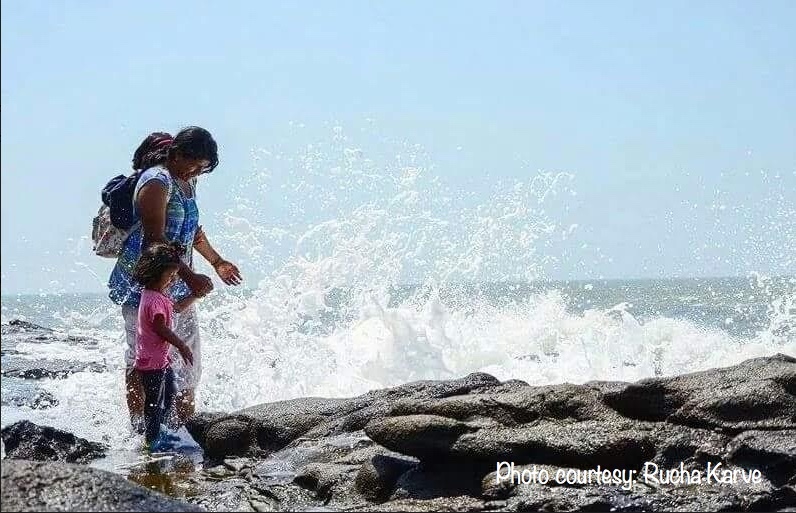 What made Rucha and Advika’s maiden trip worthwhile was that they witnessed Olive Ridley Turtle hatchlings for the first time. Rucha still can’t get over those little ones waddling away towards the water. This was one life-altering experience for her and from then on, Rucha has been adding links to the chain and there has been no looking back. torch, first aid kit and some snacks for the journey and you are done. 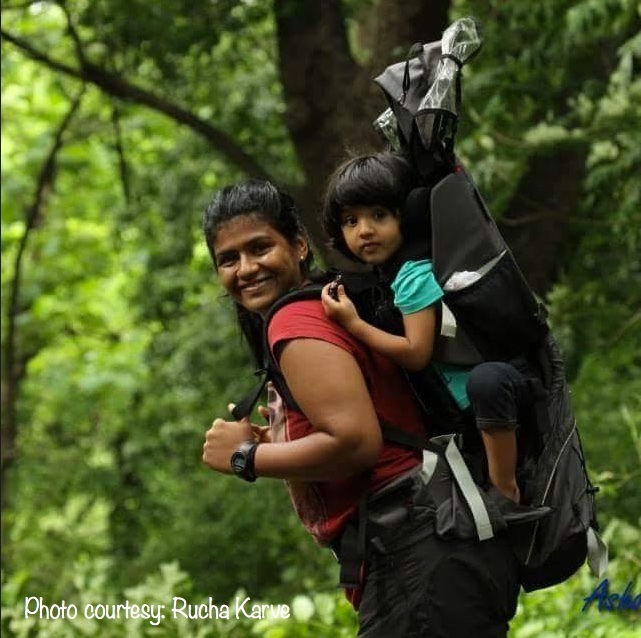 Now I have a few sacks of varying sizes depending on the number of days/kind of trip,” explains Rucha. 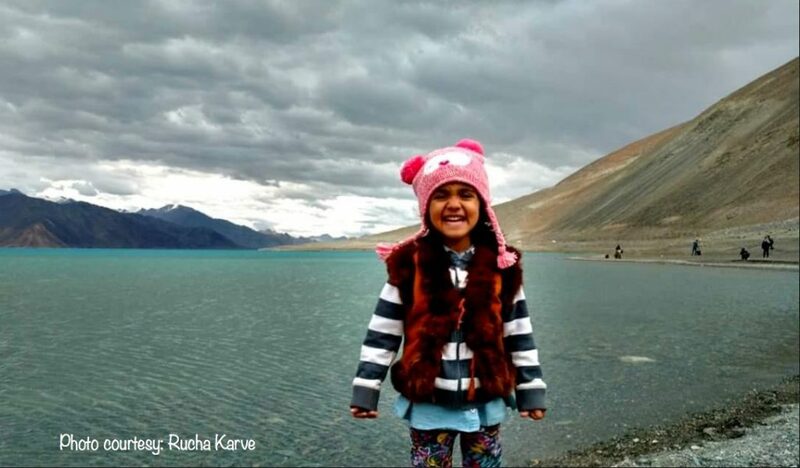 ‘the_lil_wanderer’ is Rucha’s official Instagram page where she tries to document snippets from her trips. It is mostly a journal of the things Rucha and her daughter have explored together, the places they have seen, the culture they have experienced and the food they have eaten. Earlier it was mainly just minimising the load while travelling. Carrying the bare minimums and yet carrying enough. Striking that balance is what’s a little taxing. Rucha has a list that she goes by, and it works out in the end. “While travelling with a child, one of the main challenges is to find food during the journey. You see, not every train has a pantry, you can’t find something as common as an idli or a chapati everywhere. Last year we went to Bangkok, Advika was three then, and we managed mostly with fruits, eggs and bread. While the rice was readily available, any accompanying curry was extremely spicy,” mentions Rucha. But Advika’s accustomed to their travels now. 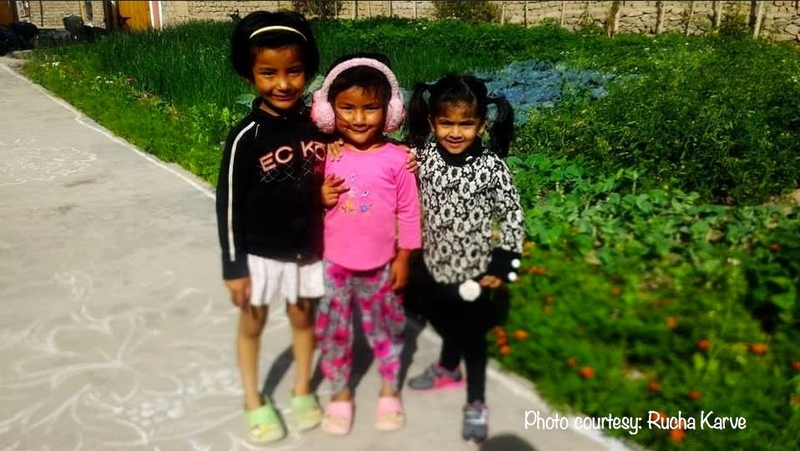 Even if Rucha is in a remote village, the little one manages with the most basic of food. What makes travelling solo with a child so unique? We started our travelling with Velas where we saw beautiful Olive Ridley Turtle hatching, then Malvan, Dapoli, Ladakh, Manali, Goa, Gangtok, Thailand (Bangkok, Phuket, Krabi), Bhutan (Thimpu, Punakha, Paro) Harihareshwar, Srivardan, Bangalore, Karla, Lonavala, Ganpatipule, Kolkata and Delhi. Not to mention the multiple animal safaris at Tadoba, Pench, Nagzira and Bandhavgad and a few peaks trekked by her in Maharashtra. 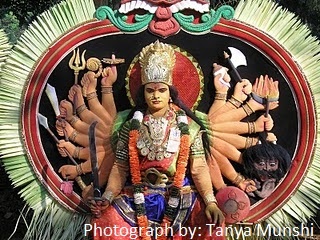 Ruche shares her invaluable lessons that she and her daughter imbibed during their journeys. The first and most important learning lesson was that children are far more adaptable than we give them credit for. Small worries like soiled clothes, cold or hot weather, availability of preferred food are very small worries when compared to the experience you gain. Next is that no matter where you go, you will find kind people around you. They will be willing to help you and trying to as accommodative as much possible. Also, we realized that their homes may be small but their hearts are really big. 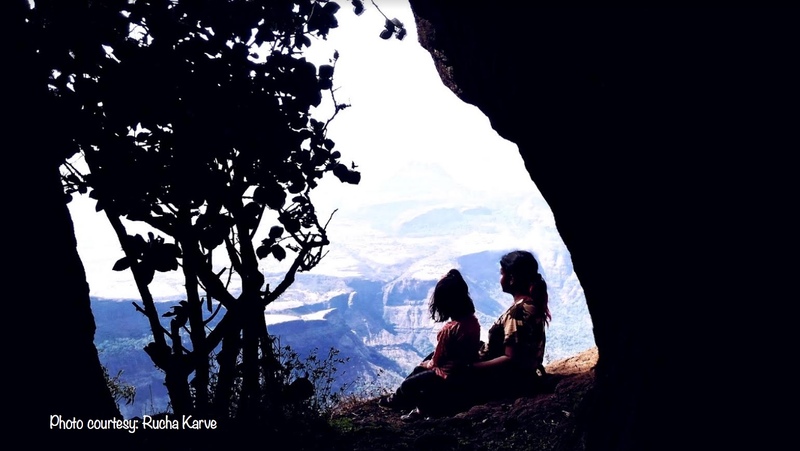 Advika finds happiness in rocks and soil, not missing her toys or the comforts of home. These short bursts of periods away from our materialistic belongings have brought us close to each other and close to nature. 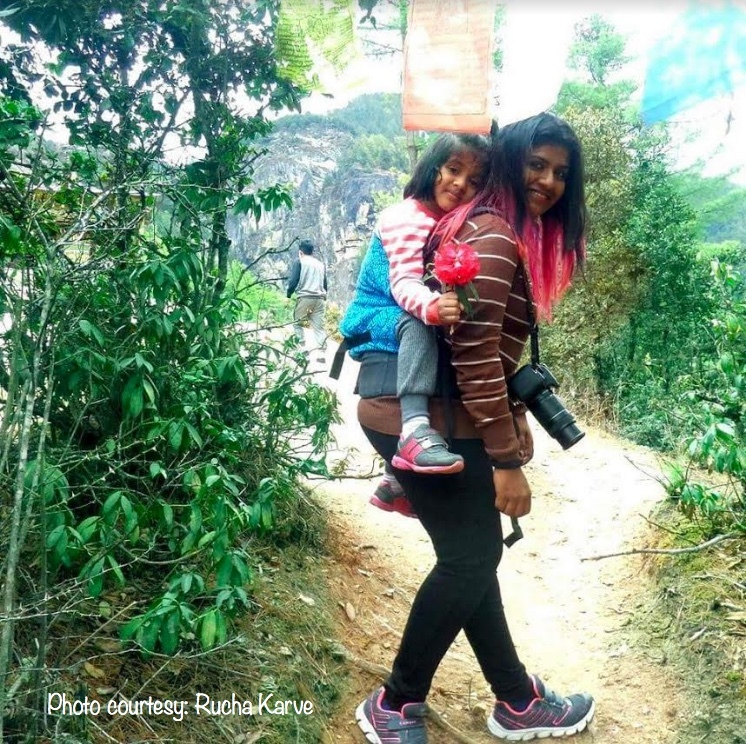 We asked Rucha how would she encourage fellow mums to travel with their kids. Rucha also strongly feels that the bond we develop is something extraordinary. These experiences that she and her daughter have shared have knitted them together. The questions that she has why does Bhutan have prayer flags? The different ways that people pray? To the lack of electricity in remote areas, and the joy of camping by the lakeside – it makes them more accepting and understanding of the world around us. In fact, all these trips has made Advika more sensitive to nature and she’s very interested in birds and animals especially after the safaris she’s undertaken. Why don’t women travel alone? Many a time I have been asked this question as to why women don’t travel alone. When I went on my Mountain Walker trip as a lone woman with my team, it came as a big surprise and a beautiful revelation for many. The thing is, we as women draw boundaries in our minds, and that the world is gradually getting more acceptance and respect for women and women travellers. 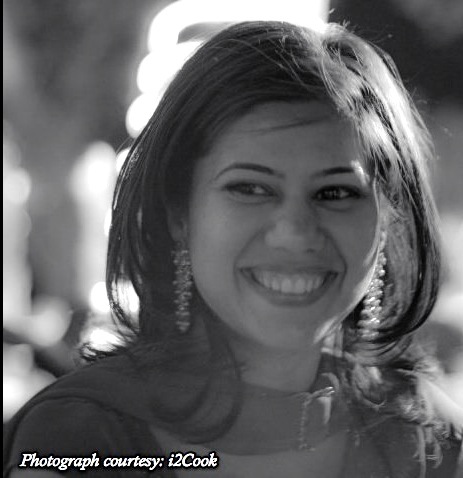 According to Rucha, she feels that in general, a large sect of women is not given the confidence that they can travel alone. When a woman hasn’t travelled alone, it’s reasonably difficult for her to imagine travelling alone with a child. The fog of dependence is so thick, that it’s difficult for them to see through it and open their horizon to new possibilities. How do you plan your travels? “I don’t fix a travel plan for the year, but I do go through a lot of websites, research a lot of destinations. But there is no annual plan. Plans are mostly made a month or so in advance,” adds Rucha. Right now Rucha is planning a trip to Madhya Pradesh with a rough sketch of the places she wants to visit. She plans to take the road and railway maps and researching every stop, considering how much time she would need in a city. “When I finally do decide to go, I’ll be booking train tickets to and from the first and last destination respectively, while the remaining will be on the spot including the stay, the bus bookings etc.” mentions Rucha. 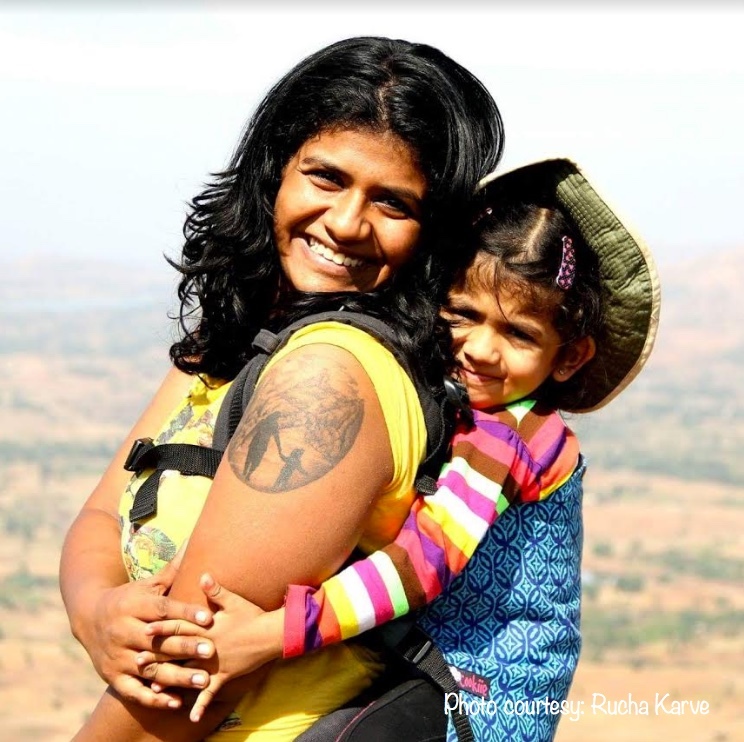 With this, Rucha signs off while preparing for her upcoming short trek to Harishchandragad. Are you envious already? You should be. But that shouldn’t stop you from heading out. The world is your playground mumma; go out and explore! On a trek to Tigers nest, Paro.